UCLA Health volunteers are exceptional individuals who give back to their community. Over 3000 people volunteer monthly throughout 250 departments at UCLA Health. These men, women and teenagers donate their time and share their talents throughout our hospitals, research facilities and patient care areas, bringing a special personal touch to our patients and families. 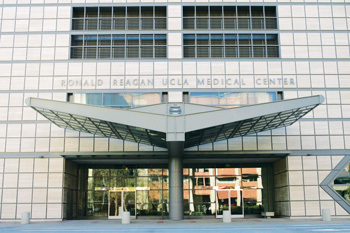 The volunteer program at UCLA began in 1955, just a few months after the Medical Center officially opened. The program was designed to assist the Medical Center in its threefold mission of patient care, education, and research - and that remains the goal of the program today. The role of the volunteer is not to replace, but to supplement the regular professional staff, enabling them to provide the best medical, nursing and support services to our patients. Our volunteers are unique men and women of all ages, from varied backgrounds, with different abilities and motivations behind their interest in volunteering. However, our volunteers share a common goal: an interest in helping others and a commitment to serving. The dedication, time and efforts of our volunteers are greatly appreciated by UCLA staff and patients. UCLA Health volunteers have earned an outstanding reputation for their consistently high level of professionalism. We count on our volunteers to uphold that reputation by maintaining high standards and traditions that distinguish our volunteers by their experience, talents and enthusiasm. Here you will find information on how to volunteer at UCLA Health. We look forward to getting to know you in the coming months. As a UCLA Health volunteer, we hope you will experience the special pleasure that comes from giving yourself to help others. Thank you for your interest. When you choose to volunteer at UCLA Health, you become a vital part of a vibrant healthcare resource in the heart of West Los Angeles. We are rich with history, innovation and achievement. Science in the laboratory becomes practice at the bedside, pioneering medical techniques are advances, and lives are transformed. Anyone age 16 years and older may apply to become a volunteer. Our volunteer pool is comprised of high school and college students, recent retirees, people looking for a career change - anyone with a small block of free time who want to help make the lives of others more comfortable. What our volunteers have in common is that they want to be challenged, and in rising to those presented challenges, create a world of difference for our health system. Click here to read past and present volunteer testimonials. Some people can afford to volunteer entire days, while others may find themselves only able to commit a few hours here and there. Working with a volunteer coordinator, each volunteer will design a schedule that best fits his or her availability. If you are interested in working in multiple areas we encourage you to apply to each one. However, you must complete your volunteer commitment with one program before joining a second one. Please click the program below that best applies to you. *ALL PROSPECTIVE VOLUNTEERS SHOULD PLAN TO VISIT THE VOLUNTEER SERVICES OFFICE AT LEAST 2 TIMES BEFORE VOLUNTEERING.